There is no doubt that in business, or nearly any area(s) of life, those who wield the best interactive social skills have a huge advantage over those less adept at social interaction. 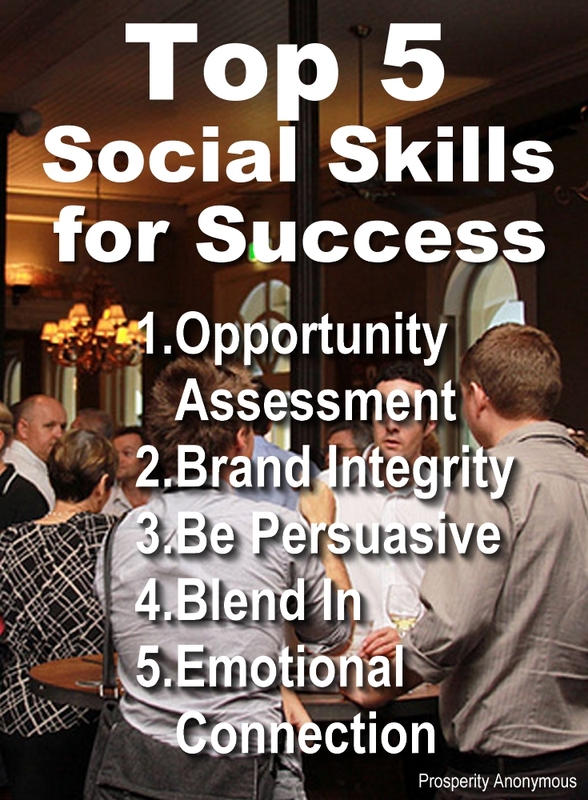 Some people are born with it; others make the effort to develop these social skills to increase their advantage in the world as we know it. It really all comes down to economy of effort, meaning that the most successful people are able to accomplish so much more in much less time. 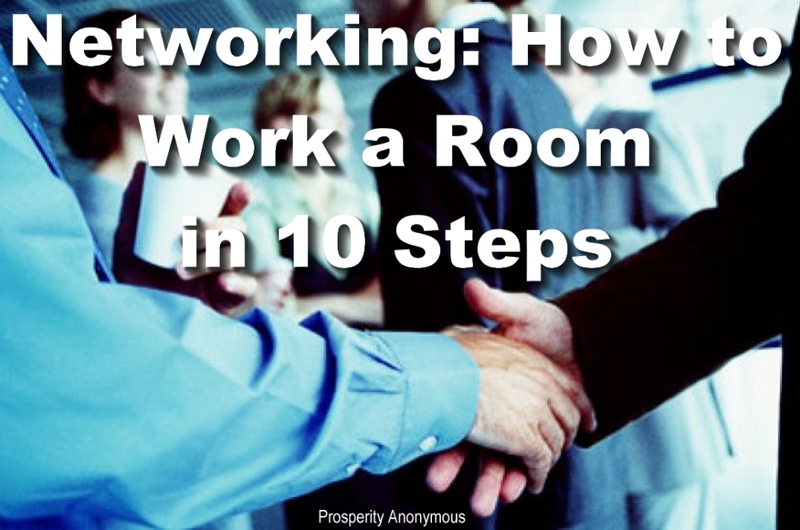 This ability would be considered self-serving by most of the general populace, but being able to quickly identify people to interact with that can best benefit you is a key skill that should be mastered by the successful businessperson or entrepreneur. Think of it as having two minutes to make the determination whether the individual will be beneficial to you, your professional concerns, or may have skills that will help you to further your purpose. 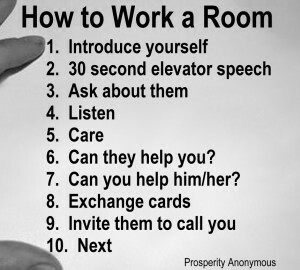 You must always be polite, never rude, as you quickly express your purpose and try to learn as much as you can about the other person, limiting yourself to your 30 second elevator speech, then ask questions to determine whether there exists a potential opportunity. Take care when interacting with others in the boardroom, in public, from the stage, during interview and face-to-face to stay congruent to, promote and protect your brand. Be cautious. For some people, it is the person that is their brand; their name, their appearance, their convictions and public persona. 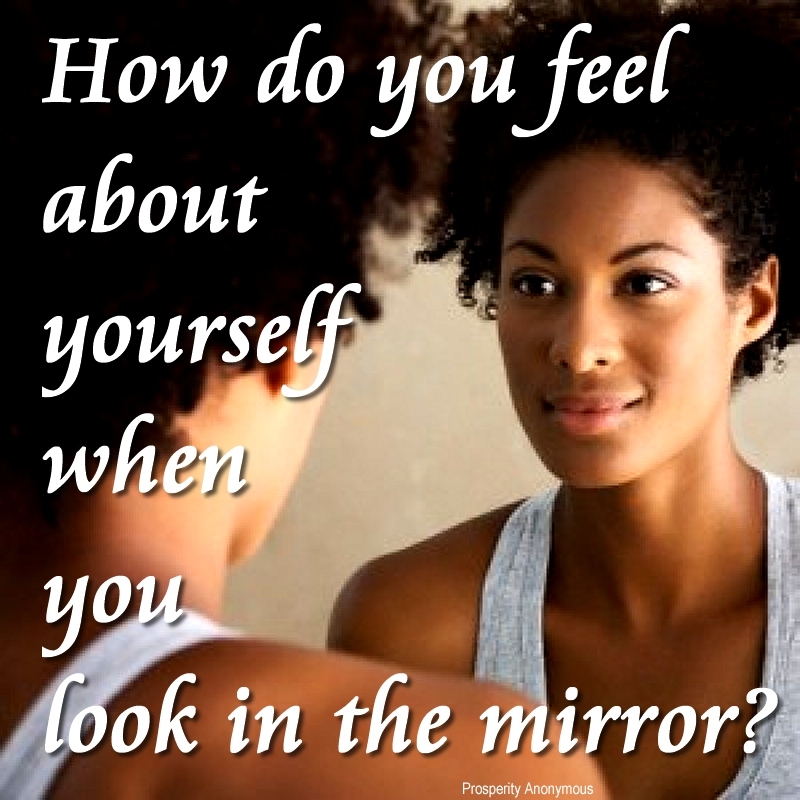 Whenever possible in all the things you say and do, be consistent to the image that you want to be remembered as. For others their brand may be a product or service. Do not expose behind-the-scenes information or data that might reflect poorly on your brand. This means that some topics may need to be avoided in order to protect your brand. One of my mentors insisted that, “salesmanship,” and/or persuasion was the single most important skill to possess if you intend to enjoy any level of intentional success. Obviously, having the ability to promote and sell your perspective, product or service on-demand can have huge impact on your overall success. If you’re not born with a persuasive personality, this could be (and often is) the most challenging skill to adequately wield, as it can be the double-edged sword that improperly used could actually backfire and cost you a sale, potential client or cause people to question your motivation. This is a delicate balance that takes both balance and practice. You don’t want someone to remember you as the pushy salesperson or jerk. Nevertheless, you must be able to encourage others to see from your perspective, whether they are friends, potential fans (who will promote you and/or what you do), customers or clients. This is the ability to relate to anyone on their terms. That means, regardless of whether you are speaking to a group of people or in a one-on-one conversation, you have the ability to see from their perspective, being thoughtful enough to use a similar style of speech (as long as it does not interfere with your brand). Not just for those with political aspirations, being able to blend in is skill of adapting to any unique social setting and maximizing one’s exposure without standing out too much and being mindful of brand protection. Interact with people in such a way that demonstrates that you are compassionate and passionate with a full array of emotions, communicating with feeling. When active in communication use voice inflection that enables your audience to perceive that you are enthusiastic, confident and competent. People love emotions and they listen for your emotion in your vocal interactions with them. Speak from your heart to theirs, making an intimate connection. If you feel as though you do not possess this skill, you can practice, practice, practice with a simple audio recorder. Practice reading and talking using a variety of vocal styles. If you have young children, reading children’s books and stories and vocally representing the voice of different characters is perfect practice (plus your kids will never forget your story-telling abilities). The best way to start building these skills is to start hanging out with other folks who already possess the skills you desire. Keenly observe them and model their behavior. Go to seminars, events and watch videos of live presentations. 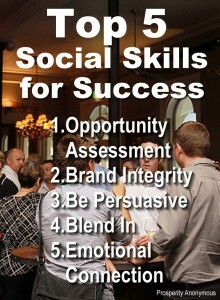 Study how others perform their social magic, take notes and practice doing what they do. Am I Too Shy to be Massively Successful? Almost anyone can go through periods in their life of shyness, especially if life has caught them off-guard or if they’re in a position to question their worthiness. In the event that you see what may be perceived as shyness come and go, then you probably need to do some internal work on your self confidence. 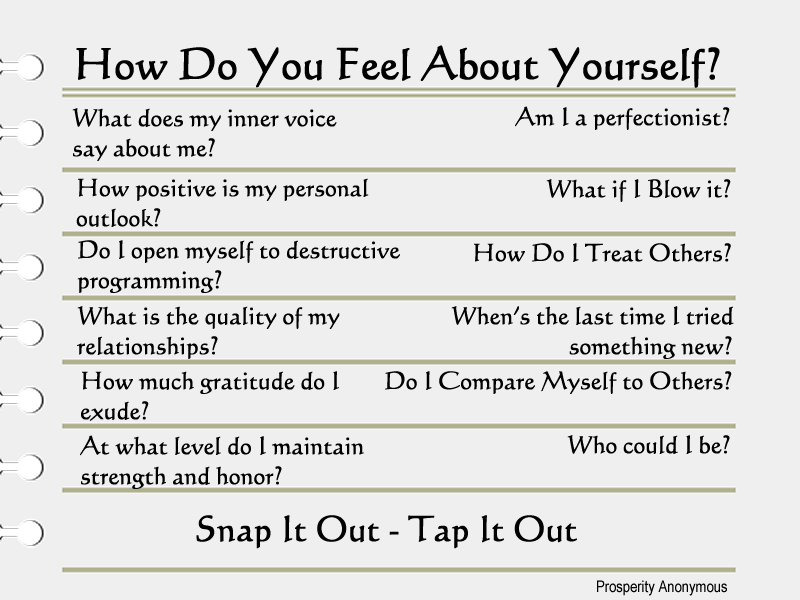 This will help you get back on track and in the flow of self-empowerment. If it’s a condition that you stuggle with all of your life, day in, day out, you may be an introvert. Contrary to belief, introverts are not shy but rather approach life and expression of self in a different way that extroverts. In fact, you may be comparing yourself to the wrong folks. If you’re comparing yourself to the loud, boisterous, famous people who dominate the press and tabloids, then you would certainly feel inadequate if you think that this is what you need to act like if you desire success. 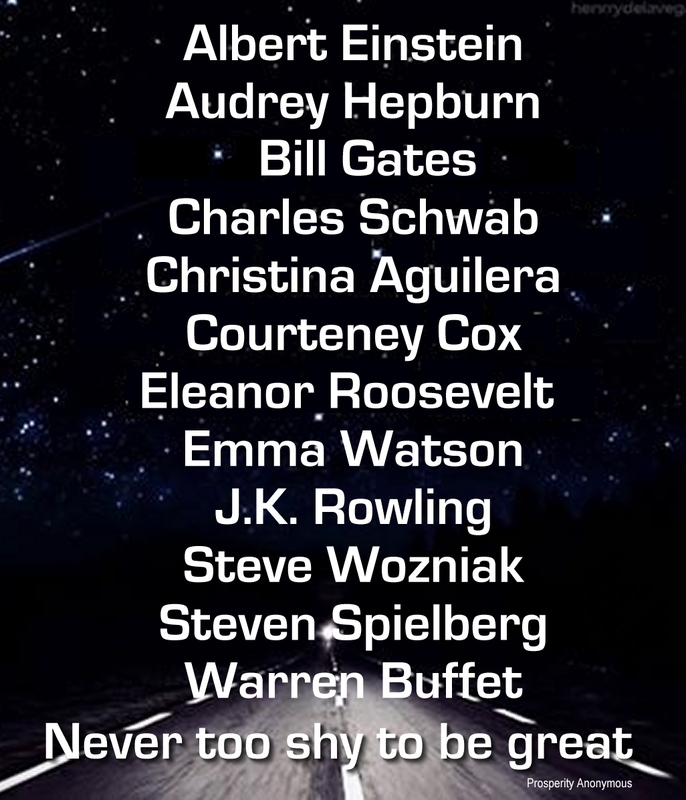 On the other hand, if you compare yourself to other introverts who have made huge contributions to our world, you realize that you are absolutely perfect just the way you are. Abraham Lincoln was an introvert and struggling with self-consciousness did not prevent him from taking massive action for the world at large. Not bad to have your name amongst those on that list, right? More cautious and are prone to be less reckless than their extroverted counterparts. Able to avoid the spotlight (tabloids) and are less likely to receive negative press on the front page news. Gifted with the ability to carry on meaningful conversations (not just idle chit-chat). Make other people feel as though you really care and are actively listening. Avoid small talk, have meaningful conversations and active listening. To under promise and over-deliver, unlike extroverts who tend to overstate and fail to live up to expectations. Since they can be content with spending time alone and away from the crowd, this gives them time to be more contemplative and creative than their peers. Work productively in an organized space and manner. In the corporate world it is not unusual to discover that the introvert who has worked his or her way up the internal hierarchy is considered the “secret weapon” of the organization. They are highly valued yet do not seek praise or public recognition as they are more comfortable in a respected support position in the background. Alternatively, there are some things that you’re less likely to be good at. You don’t necessarily have to learn to act as if you are an extrovert, but you might consider expanding your skill set to include some of the things that come naturally to extroverts. Keep your eyes open for opportunities to engage in activities that you have never participated in before. Though this may be an uncomfortable challenge, think of it as learning to help others with similar inhibitions (because we’re more likely to be motivated to do something for someone les, than ourselves). Following the experience, you may be surprised to find it enjoyable or rewarding. Congratulations for getting ‘er done. Remember to take baby-steps toward your success. Don’t try to bite off more than you can chew. You could be easily overwhelmed and if too far outside your comfort zone, you might tend to bag the whole idea. It’s better to be content with making a little progress every day (or regularly) than expecting to establish a high degree of competency overnight. Reward yourself with solitude to recharge after engaging in a personal growth exercise and remember to love yourself because you are perfect just the way you are and totally well-equipped and poised for massive success! The better you feel about yourself, the more you will have and be able to give to a troubled world. If you are not feeling good about who you are as a person, you are more likely to be tired, depressed, feeling as if you are all alone in this world, anxious or unhappy. Sometimes our own inner voice is our worst enemy; old recordings that play on in continuous loops touting self criticism or unworthiness. Next, you want to say (out-loud, if you can) the opposite, positive reinforcement or reframe of the negative thought three times (this can be silently to yourself if you’re in a public environment where this might be inappropriate). If you want to take control about how you feel about yourself, it is imperative that you take action to control what information your mind has access to and/or how much attention you will give to certain kinds of data. I routinely get exposed to data that is extremely interesting to my scientific mind. Then I have to ask myself, “Am I willing to dedicate a great deal of my life’s work and energy to this topic?” One must manage economy of time, effort and concentration. Learn how to say, “No,” to some projects that would be better served by someone else’s expertise. Learning to tune out unnecessary input can help reduce the white noise in your thoughts. Consider getting a small notebook to record the three things that you are grateful for each day. Review the list by reading it back to yourself out loud and smile. You may be surprised that as you look for the things that you are thankful for, you will find more good things happening in your life as you look for them. m down, then read them out loud. If you are in a leadership or influential position, don’t tell others what to do (especially if it sounds like judging others or preaching). Instead lead by example. Let others see your good works and allow them to emulate your performance. It is better to get a thing done, than to do nothing from fear of not being able to complete it perfectly (or procrastination). Perfectionists also tend to expect more from their peers, which tends to be a constant cause of frustration. Learn to be more tolerant and let others do the best they can with the tools that they have (not everyone can be as wonderful as you; and that’s okay). Learn to let others be. There’s nothing better than The Golden Rule, “Do unto others as you would have them do unto you.” No matter what you station in life (even if you feel like you’re at the bottom), there’s always somebody worse off than you. Model your mentors and heroes, act as if. I hear you saying, “You mean to fake it?” Yes, fake it ‘til you make it. It what everyone learns to do; royalty learns to act like royalty by “acting the part,” just like an actor plays a part. As his or her highness is adequately groomed and coached, they appear to be the person they are supposed to be. There is no higher calling than to accept the call to be your highest and best. I applaud you for the new you that you are becoming. You are a shining light peering out of the darkness. 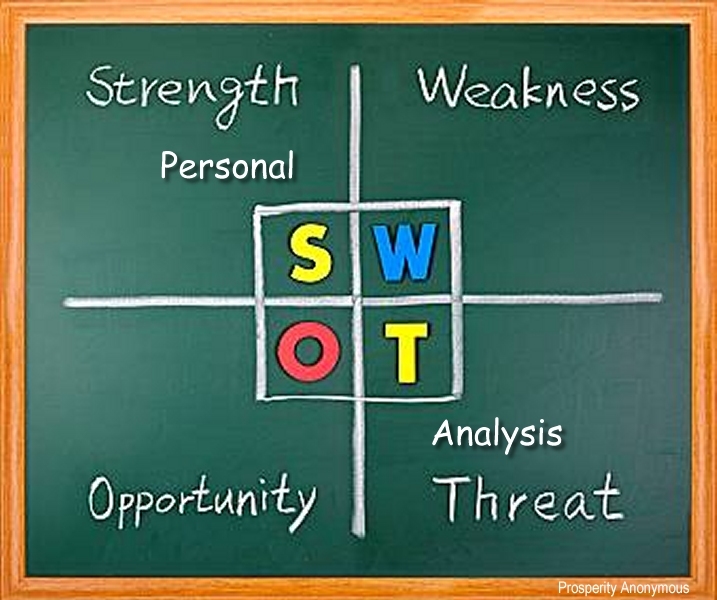 Harvard Business School professors, George Albert Smith Jr and C Roland Christiensen developed the first incarnation of the SWOT Analysis in the fifties and later, Stanford University’s Albert Humphrey adapted it for use in organizational strategy. This tool is as effective today as it was then and is an excellent way to establish your baseline prior to entering a potential business venture. Using this analysis you determine what are your Strengths, Weaknesses, Opportunities and Threats. This same system can be adapted to evaluate your innate abilities and challenges. 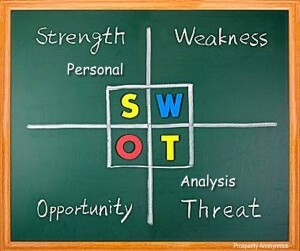 To create a Personal SWOT Analysis, simply title each of 4 pages with Strength, Weakness, Opportunity and Threat. Always start from a position of strength. So list all the strengths tat you possess, personally and professionally. Think about answering questions, like, what are the things that you do well? What unique personal resources can you call up? And, what do others see as your strengths? Understanding our weaknesses is so empowering. 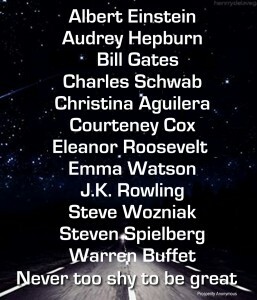 On this list you note the things that are difficult for you, that you admire in others and which you possessed yourself or activities that you’d rather not participate in. Think about asking yourself, in what areas could I improve? Where comes easier to others than me? How do others see as my weaknesses? This is an excellent opportunity to review skills that you need to be aware of either opportunity to gain the knowledge or skills for yourself or alternatively seek resources for outsourcing. We are all surrounded by a myriad of opportunities for personal growth. 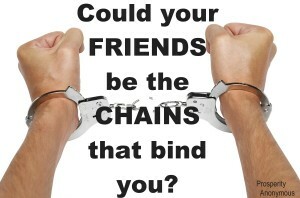 You may be aware of some that are immediately within your grasp, others you may need to begin to look for. List the opportunities that come to mind regarding personal growth or expansion at home, at work or in relationships within your circle of influence. Maybe consider taking steps to grow your audience. Keeping a keen eye for opportunities to share, care and grow will keep you on the leading edge of your life’s journey in style. Ask questions, be curious; about life, what are other people doing that you look up to, competitors, or associates in your field. You may uncover other opportunities by being more aware. Thoughtful, metered Googling and social media excursions can help keep you abreast of opportunities, but you must stay in control. Don’t let these tools become your weakness. What are the roadblocks that appear to be in your way? What stands between you and what you desire? What are the challenges that you face? BY clearly defining the threats to your success, it is easier to map out a route to circumvent the threats that may turn out to be opportunities for personal growth. In the event that you decide that becoming an expert in the thing that may be blocking you is not congruent with the person that you are… No problem. It’s an opportunity to outsource; find, hire or trade services with someone who would love to handle this for you. Using this personal SWOT Analysis will help you grasp what assets you possess (many we take for granted), and what your shortcomings might be (many are exaggerated and easily overcome) and having it in black-and-white will help you chart your journey to unbridled success. By engaging all of your information receptors in the attenuation of your end result, you can avoid distraction and increase your attention to manifest anything you want giving you the ability to make all your dreams come true. First of all, create a multi-dimensional experiential representation of what it is that you want to achieve. My primary sense is visual. This is where I start to create my vision of what it is that I desire. You could find a photographic representation of what it is that you want. If it is a particular item, it is easy enough to find a photo of the item that you want… the more photos, the better. Put them in places where you find your attention throughout the day. 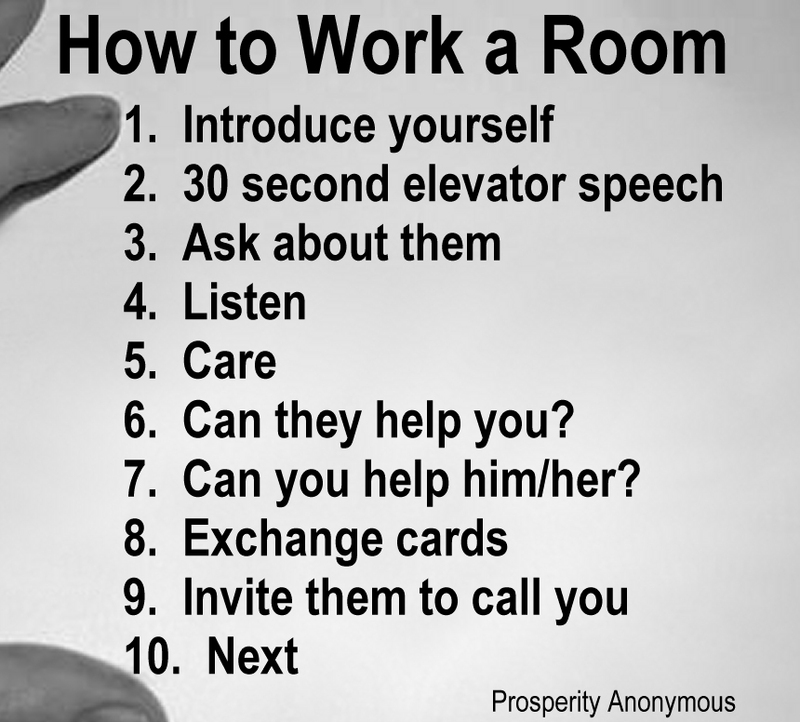 Some places might include the refrigerator, your bathroom mirror, on top of the TV, hanging from the rearview mirror in your car, even carrying a card-sized photo in your pocket that you can refer to throughout the day, and on the nightstand next to your bed. If what you’re focusing on is more complex, like an idea, concept, career, mission, etc… you may need to develop a visual montage including may images, or a vision board. A vision board is a poster-board featuring a collection of many different images that represent what you want to attract. Next up is to create an audio representation of that which you desire to engage your ears. If it is a thing, like a new Harley Davidson Motorcycle, make an MP3 (CD or mix tape) compilation of songs about riding on your motorcycle with a sound clip of the vroom-vroom (or guttural potato-potato-potato) sound of the motorcycle between tracks. Get a portable recorder and interview owners of Harley Davidson motorcycles and ask them what they like best about their bikes and listen to these periodically throughout the day. You get the idea; you can listen to audio recordings that help you to pinpoint the attention of your auditory senses via the input device of your ears. Use your voice to engage your ears. Nothing is more attractive to your ears than your live voice. Ever notice that when you listen to a recording of your voice, it sounds tinny in comparison to how it sounds when it resonates within your head? Make a list, create affirmations or a mantra that you speak aloud to command the attention of your auditory interface. If you desire a Harley, then a ride or test-drive would be an excellent multi-dimensional experience, but now you need something that you can touch and feel to focus your attention on throughout the day, when you may not have access to a physical representation of that which you seek. Create and use a talisman. A talisman is a physical charm or representation of what you desire. In fact, no other company provides more talismans for potential customers than Harley Davidson. You can easily obtain a key-fob with the Harley-logo (or any other object or form from bumper-stickers to underwear)… something that you can contact to your vision periodically. You can use any item that you want to be your talisman, including a ring, pendant, business card, silicone bracelet or wristband, a small stone or string tied around your wrist… whatever it is, it is something that you can physically touch while you daydream about your goal. Your nose knows what it is that you want, and by entertaining your sense of smell, it can create neural pathways in the brain that engage the attention of the universe to begin to vector in all the components that are necessary to bring your desires to fruition. In some cases, you may be able to have a multi-faceted talisman. For instance, if your Harley talisman is made of leather – the smell of the leather may be your mind’s nose candy. If your goal is financial, maybe the scent of cash dollars engages your sense of smell in this daily exercise. 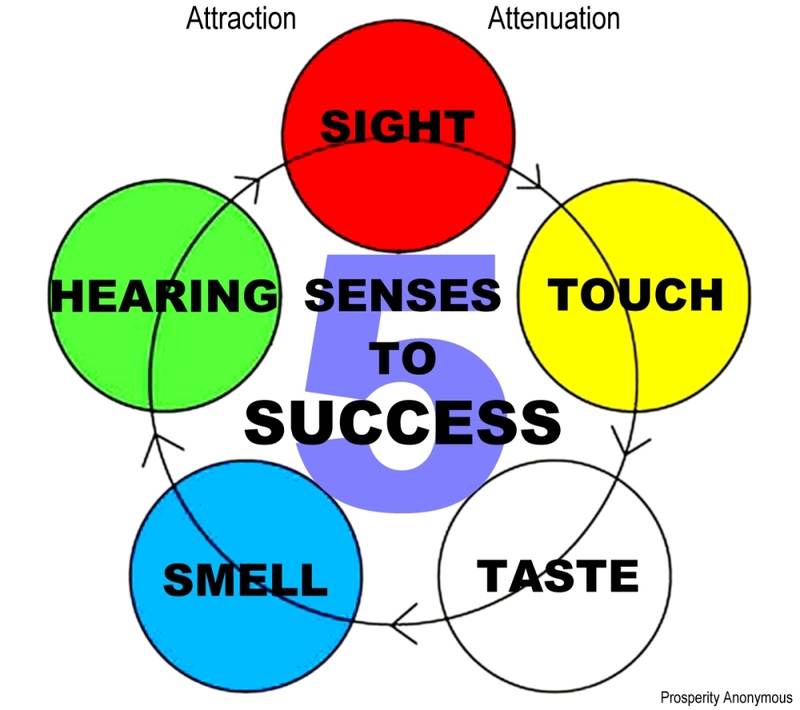 Many fragrances, potpourri, incense, essential oil scents or other items that are pleasant odiferous representations your desire(s) can be used to sniff your way to success. You might find it difficult to think of way to have your goal create an association with your mouth and tongue but it is a lot easier than you might think. In our Harley-example, you might associate the motorcycle with an energy drink (or some other non-alcoholic drink). There are a variety of hard candies or chewing gums that come in a wide variety of flavors; some which you have never tasted. You can select one of these flavored-items (that you have not tasted before, so that the taste is not associated with anything else from your past) to represent you wildest dream(s). Focusing on what you want while you excite your flavor receptors will increase your laser focus. By engaging all five senses, you attune your vibration to that which you seek. Just the fact that you have the desire means the universe has already matched this desire to you. Now, all that is left is for you match your vibration to what seems illusive. It has already taken place; you just need to do the work to align yourself to the end result. Get the sense that your senses can get you from here to there, and they will. 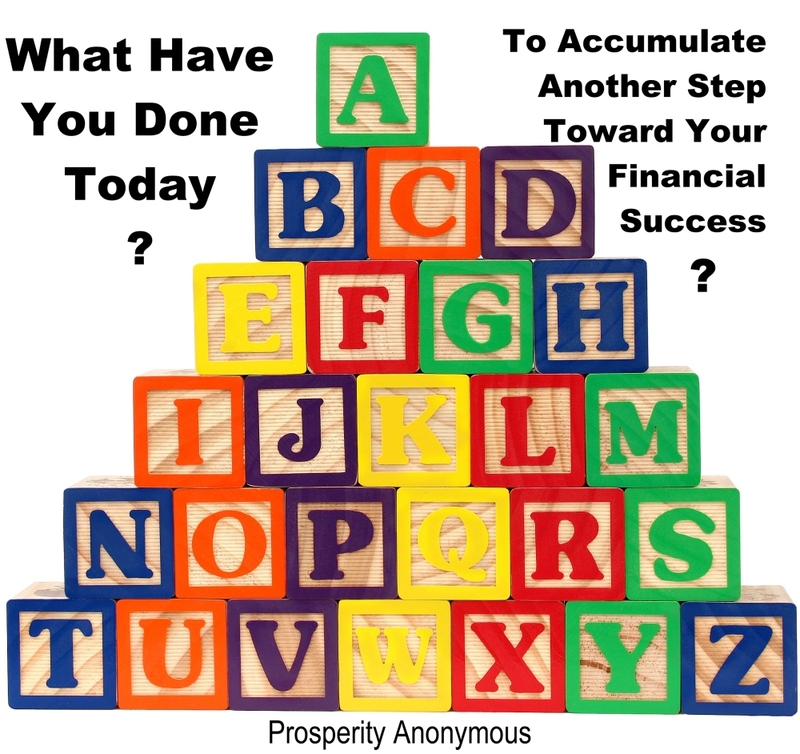 Prosperity Anonymous is a place to belong to if you’re tired of being surrounded by unsuccessful individuals but have decided to embrace being successful in spite of the folks that are nearest to you. 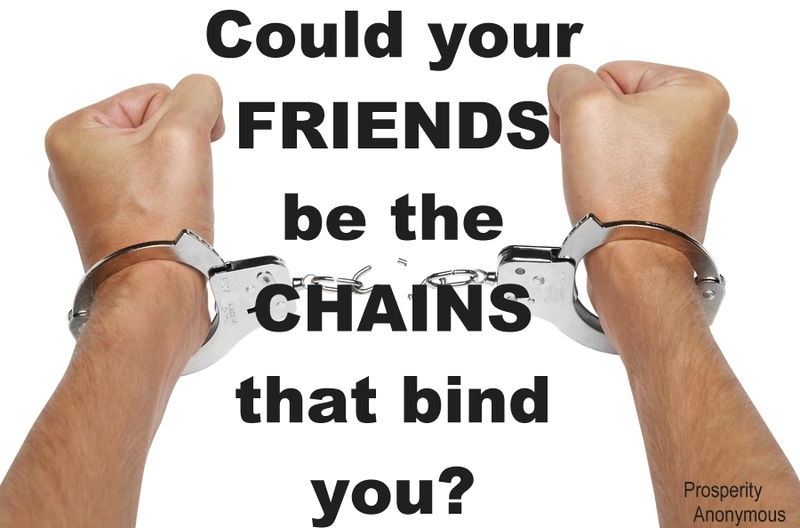 Your friends and associates may be a challenge preventing your growth, especially if they view your desire to be successful as folly… It is not! Rise above the negativity by joining with others, just like yourself, who seek to be successful and are taking the steps to move above and beyond the negativity, to embrace a successful lifestyle. Darnell needed to create a, New Normal… and he was self-motivated, committed to his goal and I was honored to be invited to watch his story unfold. He started a business and began the creative process of building the business, creating his brand and promoting his business, while working on his own lifestyle readjustments along the way but it didn’t happen overnight. It took a lot of work, dedication, cutting ties and building new relationships. Is it time to re-evaluate and make a change? Is it necessary for you to consider adjusting your social matrix, evaluating potentially unhealthy relationships to move forward into the life that is calling you? Prosperity Anonymous is a support group for you if you’re seeking to make your mark and a significant impact in your life and/or the lives of others. If you’re struggling with getting from here to there, together we can get you pointed in the right direction and in the flow to get where you want to go. What Have I Done Today for Success? Maybe we felt more motivated yesterday, but today we’re feeling less confident for whatever reason, and it’s easier to just relax. Maybe yesterday it was easier to believe in the possibilities of success, but today, you look around to see yourself surrounded by the status quo. The status quo does not want you to stand out in the crowd embracing all your gifts, qualities and speaking the truth of your calling. 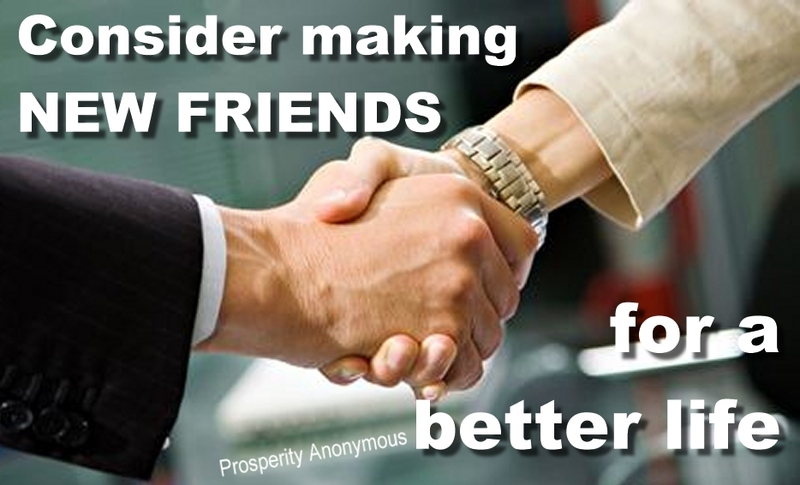 That’s what prosperity Anonymous is here for; we can help you get from here to there. You are not alone. We believe that by locking arms one with another in an effort to make the progress necessary to be the change we’d like to see in the world. If you are finding it strenuous to stay on-track, we can help to team you up with an accountability partner. As a brute group force, together we can be unstoppable. Contact us to begin to change and help others be the change. You can do this. This is the reason you are here, today, right now ready, willing, able and committed to taking those daily steps. Keeping each other accountable is imperative to your group’s success, left to your own devices, you might lose focus, or get distracted by life circumstance(s). Knowing that you have other members of your group to report to next week helps to motivate you in order to have something good to report about your project. This replaces the militaristic approach to self-discipline and replaces it with an enjoyable motivation allowing you to share the rewards of being able to report your progress to others who are vested in your continued success, a more positive model that going-it-alone in your own lone-wolf-style. So, you’re headed to you meeting and you realize that you’ve only accomplished two of the ten tasks that you had promised your teammates that you were going to get done this week. What happens then? That’s where the accountability comes in. You voluntarily selected this team and/or these members and in doing so you allow them to nag you or motivate you in any other way necessary in order to assist you on the path to your success. Don’t be one of the many people who have had a good idea, business potential, book hidden within, elusive successful dreams and aspirations, whose lives have ended, never having realized their dreams or potential. By teaming up with your peers, people who think and believe as you do, makes all the difference. While our mission is relatively new, we can use all the help we can get. If you are a masterminding or prosperity anonymous member, please e-mail us. Alternatively, if you have uncovered a valuable online resource that you think would be of value to our users, then let us know, so that we can make it available to other users and visitors. The premise of the Prosperity Anonymous mindset centers around the principle of the Mastermind Group that was delineated by Napoleon Hill in the book, Think and Grow Rich. In the Prosperity Anonymous model, we refer to our system as representing, “mastermind groups” (some people refer to them as success teams, cell groups, chapters, support teams, etc…) of individuals numbering in groups of two-to-six individuals who share like goals, benefit from each participant’s area of expertise, supporting and encouraging each other and holding each other accountable. 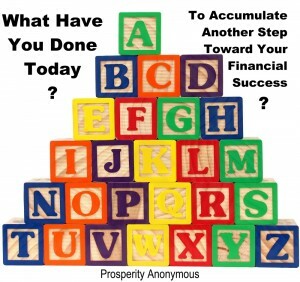 At Prosperity Anonymous we help you to achieve abundance in many different areas of your life. Achieve success in the all areas of life including finance, love, increasing your personal power to attract greater success and financial freedom. Enjoy manifestation of greater wealth, health and helping to make the world a better place. If you’re having trouble achieving your highest and best on your own, we will help support you to become the change you desire to see in the world.